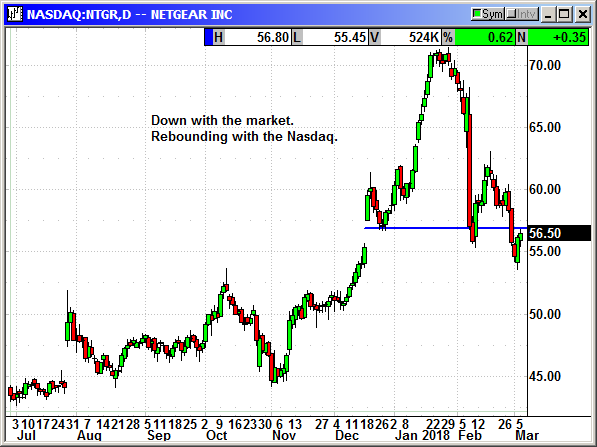 Was Monday's market recovery a dead cat bounce or the start of a new trend? Obviously, we will not know that until Friday but all the overseas indexes are positive on Monday night and that is a good start. It appears the threat of a metals tariff has diminished. There may still be something implemented but it may be watered down or targeted and the market can digest targeted tariffs. The market was oversold even after the Friday rebound. The Dow had declined -1,358 points from the Tuesday high to the Friday low. Many of the stocks thought to be at risk of tariff retaliation had been sold hard. 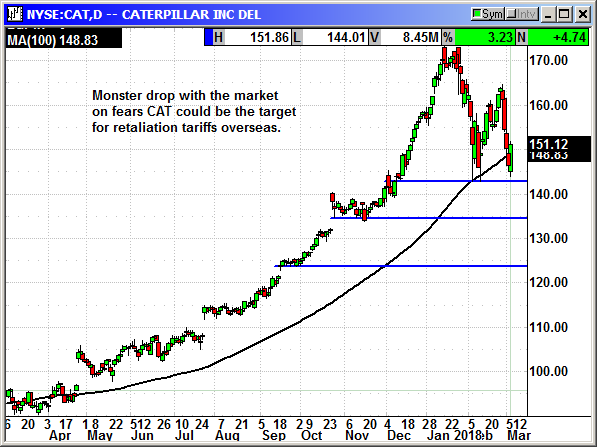 We lost Caterpillar as a result of tariff risk. 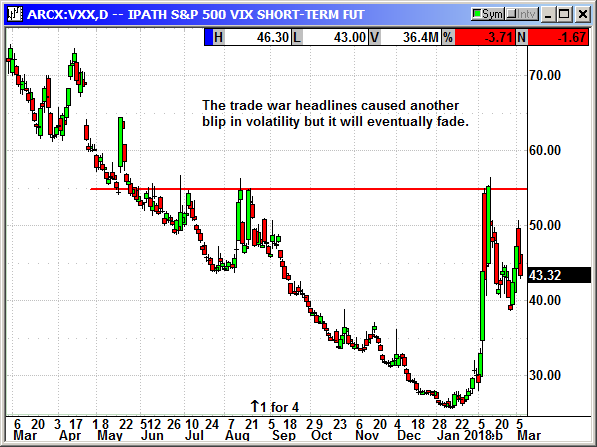 The Powell testimony on Thursday corrected the verbal errors from Tuesday but the market failed to react positively because of the tariff headlines on Thursday morning. However, long-term the Powell corrections will be market positive. We will get another dose of transparent Fed speech on the 21st when he holds the first press conference after the Fed raises rates. After the market tanked on his Tuesday testimony, I would expect the press conference to be dovish. 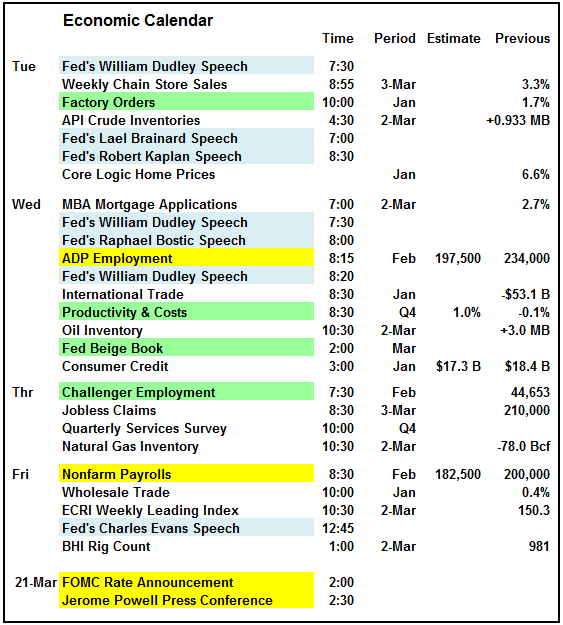 This is payroll week and the numbers are expected to be just under 200,000 on both the ADP and Nonfarm reports. The Fed Beige Book on Wednesday is expected to show moderate growth in each Fed region although they may have to upgrade their use of the word moderate to something better in several areas. The big name on the earnings calendar for Tuesday is Target with Costco on Wednesday and Dell Technologies on Thursday. After this week, there will only be 5 S&P companies that have not reported. The S&P posted a strong gain on Monday of nearly 30 points. 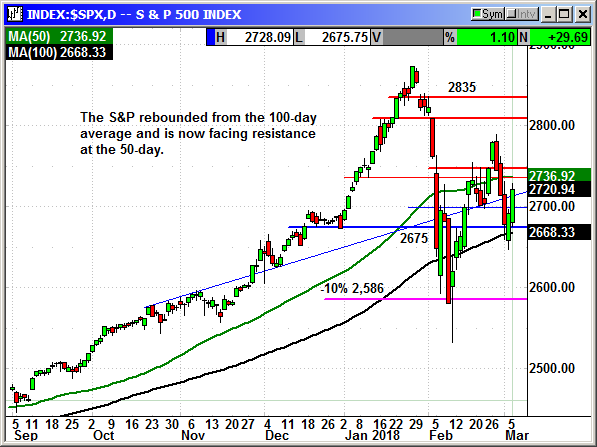 Multiple levels of light resistance were broken with the index coming to rest just under the 50-day average at 2,736. That is the next challenge if the rally was not just an oversold bounce. Moving over 2,750 will be the all clear signal that could entice investors to come back into the market. The volume was questionable on Monday at 6.9 billion shares and the lowest since the prior Monday. To put this in perspective, Thursday's volume was 9.0 billion shares. Volume is normally a weapon of the bulls and it was lacking on Monday despite the decent gains. 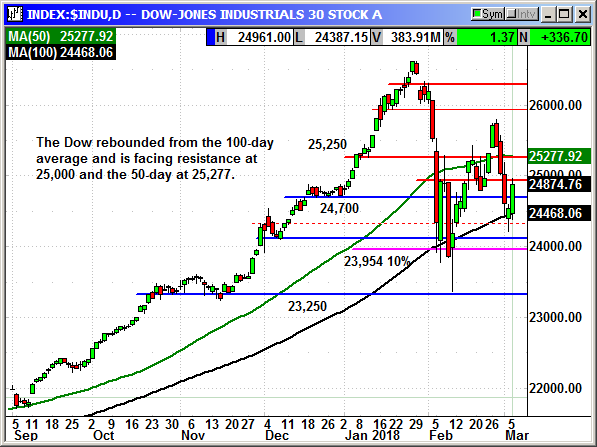 The Dow also rebounded from the 100-day average and almot made it back to the 25,000 level, which should be resistance. That is followed by the 50-day at 25,277. The Dow is not normally reactive to moving averages but has been respectful over the last month. This suggests the 50-day could be a challenge. However, the Dow tends to move in leaps and bounds so any resistance within 200 points could be eclipsed in a single day. 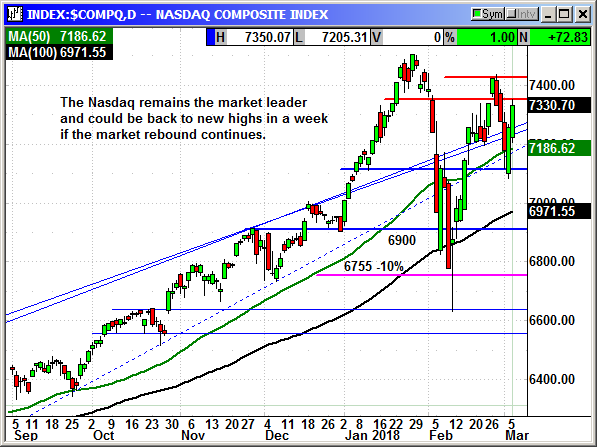 The Nasdaq remains the market leader and the index is only 175 points below its prior high. If the market remained positive this week, we could be there in no time. 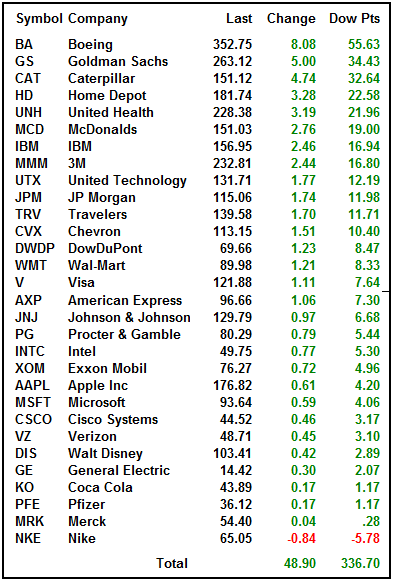 The largest of the big cap techs were strongly positive on Monday. It is possible this tech rally has legs. The next resistance is 7,350 and 7,420 with the prior high at 7,505. 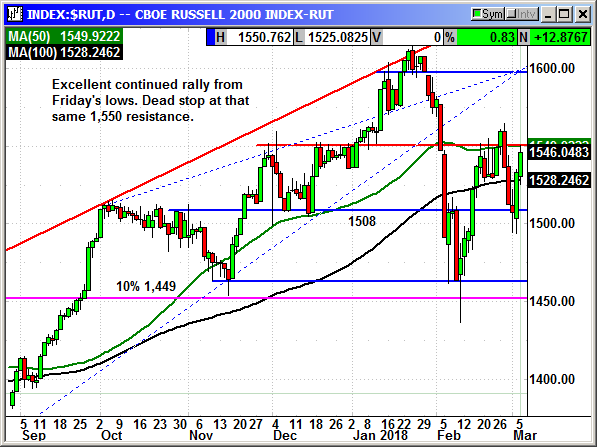 The Russell 2000 continued its gains but came to a dead stop at strong resistance at 1,550. This has been a challenge since late November and we have traded both above and below but each crossing is a fight. Since the small caps are theoretically immune from the tariffs, they should continue to post gains until the next negative headline appears. I would like to believe that Monday was a good start for a positive week. I do not expect every day to be positive but I would expect to end the week higher ASSUMING there are no headlines from Washington that are worse then the tariff bomb from last week. If the administration follows through with that tariff threat, we could easily see the market collapse to lower lows. Jeff Saut from Raymond James, normally a bull, said the tariff implementation could become a Black Swan that takes down the long running bull market. It is that important. 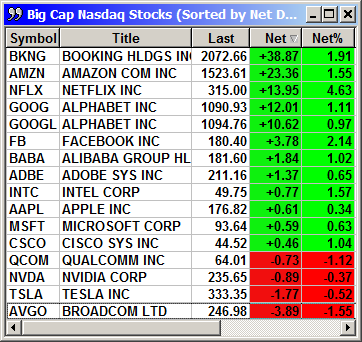 I would recommend buying the dips on quality stocks but expect volatility to continue. Buy Sept $120 call, currently $4.10, no initial stop loss. The long call position was entered on Tuesday, stopped on Thursday. 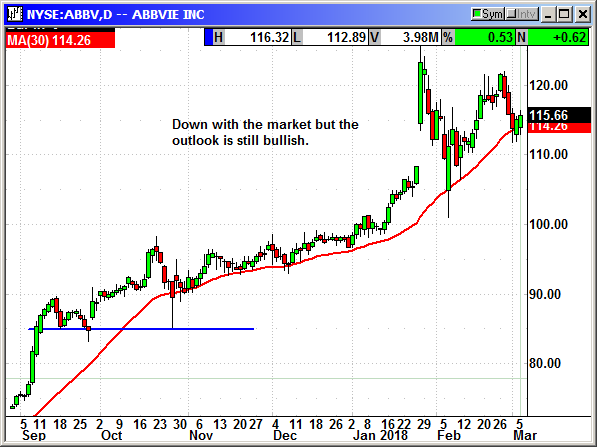 AbbVie and Biogen removed the MS drug Zinbryta from the market to evaluate the drug's "complex and evolving benefit/risk profile." They said evaluating it in the current patient base would not be possible given the limited number of patients being treated. The companies are investigating several cases of brain inflammation and liver toxicity. The drug's removal will not impact profitability. Sales were only $12 million in Q4 and $53 million for all of 2017. Patients on the drug were told to remain on the drug. Shares declined with the market. 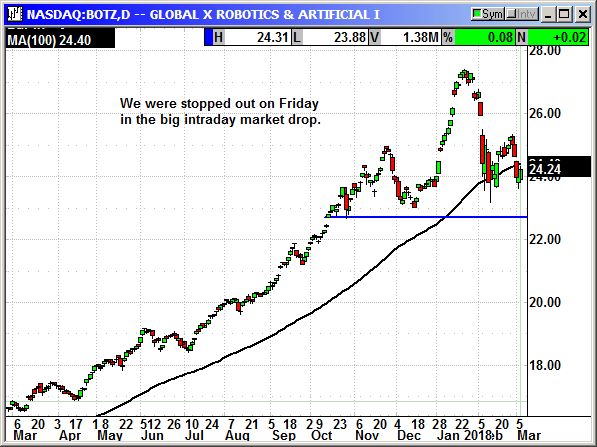 The market crash hammered stocks like Nvidia and that is a major component of BOTZ. We were stopped out on Friday. I am recommending we reenter the position at the open on Tuesday. Buy June $26 call, currently 72 cents, no initial stop loss. Long June $26 call @ $1.25, exit .35, -.90 loss. CAT was crushed by the tariff headlines on worries that other countries could put import tariffs on CAT equipment to offset the proposed steel and aluminum tariffs. We were stopped out on Thursday. Thanks to the big decline we can reenter the position using a call only position at a lower strike price. 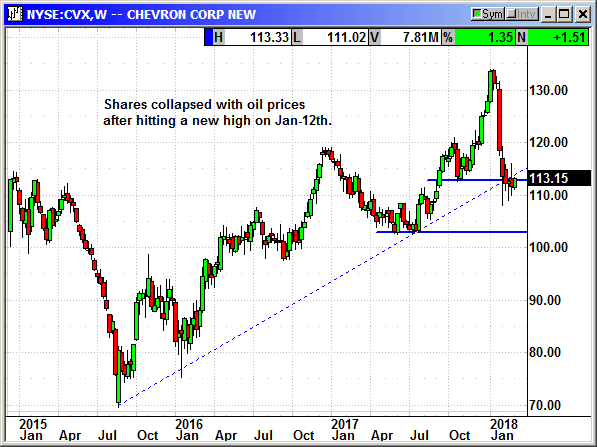 CAT will rebound as soon as the negative headlines evaporate. Business is booming all around the world and CAT guided higher for the coming months. Buy June $160 call, currently $5.55, no initial stop loss. 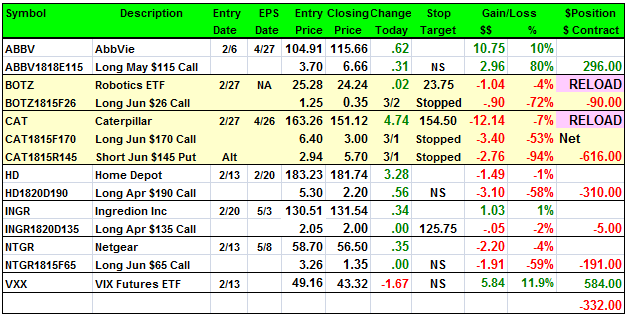 Long June $170 call @ $6.40, exit $3.00, -3.40 loss. Alternate position: Short June $145 put @ $2.94, exit $5.70, -2.76 loss. No specific news. 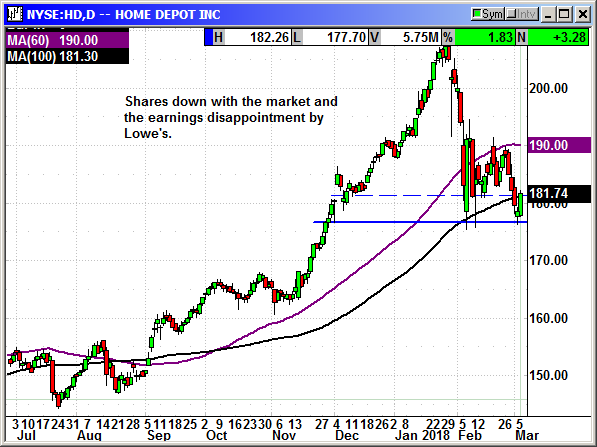 HD shares declined with the market and on the earnings disappointment by Lowe's. Shares found support at $177. No specific news. 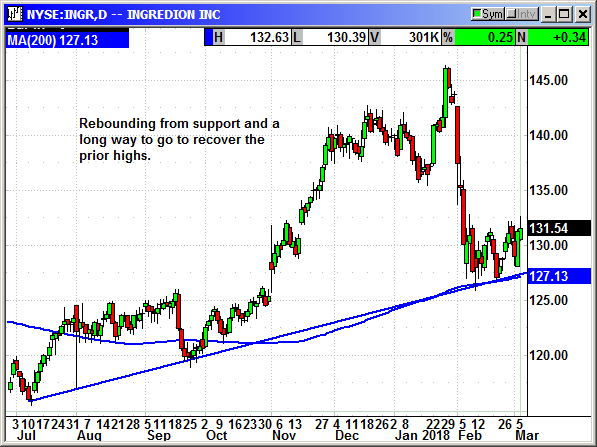 INGR continues to rebound from support and it did not sell off in the market crash. 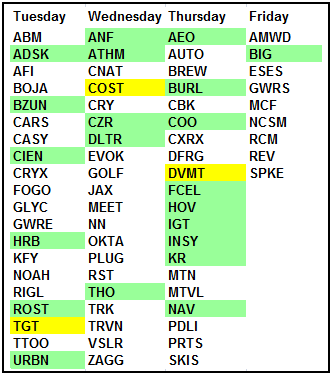 Good relative strength. No specific news. Shares dropped with the market early in the week and rebounded with the Nasdaq on Friday.